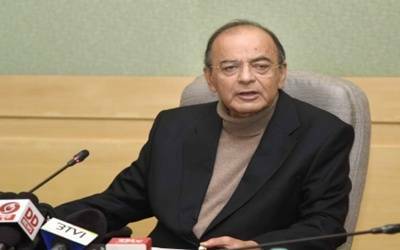 New Delhi, Feb 5 (IANS) Union Minister Arun Jaitley on Tuesday slammed opposition parties backing West Bengal Chief Minister Mamata Banerjee’s ongoing sit-in protest against the Centre and called them the "Kleptocrat’s Club" that "aspires to capture the reigns of India". "If a police officer is required to be interrogated, how does it become a ‘super emergency’, ‘assault on Federalism’, or ‘destruction of Institutions?" he asked. "Can ‘new India’ be ever run by this Kleptocrat’s Club?. "Most of them, or their affiliates are today being investigated, prosecuted and in some cases have also been convicted for crimes of corruption. Her ally from Bihar represents the party of the convicted. The friend from Andhra Pradesh runs a party of contractors, ‘thekedaars’ and money-launderers. "Her two friends from Uttar Pradesh represent the scandalous legacy of corruption. Her anarchic brother from the Delhi government is at his wits end because the penny stock companies of his ministerial colleagues have been found out," he said referring to opposition leaders: Rashtriya Janata Dal’s Lalu Prasad, Andhra Pradesh Chief Minister N. Chandrababu Naidu, Samajwadi Party chief Akhilesh Yadav, Bahujan Samaj Party supremo Mayawati and Delhi Chief Minister Arvind Kejriwal. "Mamata Banerjee’s latest acrobatics are the best evidence of the kind of governance India’s opposition can provide," he said.